With 87 million sold between 1958 and 2014, the Honda Super Cub is far and way the World's best selling vehicle and has been acknowledged as such with a three dimensional trademark of its shape. Introduced in Japan in 1997, three-dimensional trademarks can be granted to a product which has acquired distinctiveness through long and extensive use. Very strict criteria is applied to registrations, and the Super Cub becomes one of very few industrial products to achieve such status. 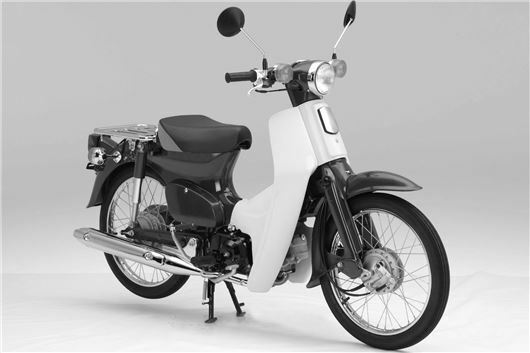 A key determining factor for the Japan Patent Office when considering the very rare endorsement was the consistent design concept which Honda has maintained with the Super Cub over more than 50 years since it was introduced in 1958; while continuously achieving functional improvements throughout its long history. The Super Cub is the world's largest selling vehicle, with cumulative worldwide production reaching 87 million units* as of March 2014, and sales across more than 160 countries.